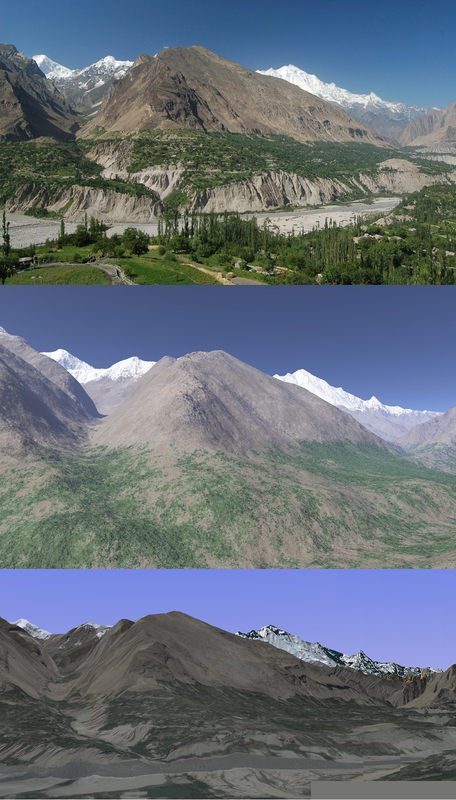 Views from near Karimabad (also known as Baltit), Hunza valley, Pakistan, to Rakaposhi. The three layer image, assembled by Giel Swager, shows a photograph, an image generated using Terragen and High Asia DEM data, and another extracted from Google Earth. The precise viewpoint coordinates are 36.320327 N, 74.666320 E.
The viewfinder panorama is shown below. Unlike the above images, it is not photo-realistic; its purpose is to provide summit identification and distances (shown in kilometres). The colors are used to provide distance contrast, and there is slight vertical magnification.